Rough, tough, and built to last - Ultra Last. Add the most durable divider to your binder for highly-referenced documents. Great for students, teachers, offices and home use. Rough, tough, and built to last - Ultra Last. Add the most durable divider to your binder for highly-referenced documents. Great for students, teachers, offices and home use. 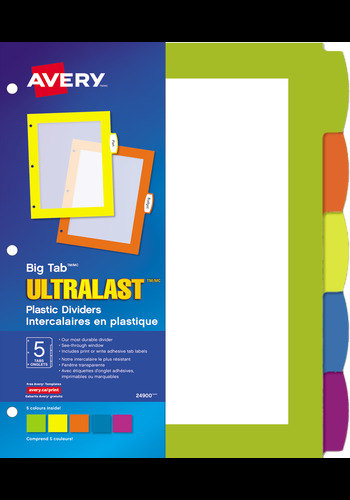 The extra strong colourful plastic dividers won't rip or tear on binder rings, and the opaque see-through window allows you to view the page behind the divider. Big Tabs are 50% larger than typical tabs for even more writing space, letting you handwrite or print more text on the included adhesive tab labels. Easily customize tab labels with free fonts and templates using Avery® Design and Print Online software. Get the most durable and organized binder with ultra durability. Extra Strong plastic is tough for heavy, every-day usage. Great for teachers, students and in the home, school or office.